What you’re looking here at is Beta Pictoris b, a gas giant about ten to twelve times the mass of Jupiter that circles a star over 60 light years away. 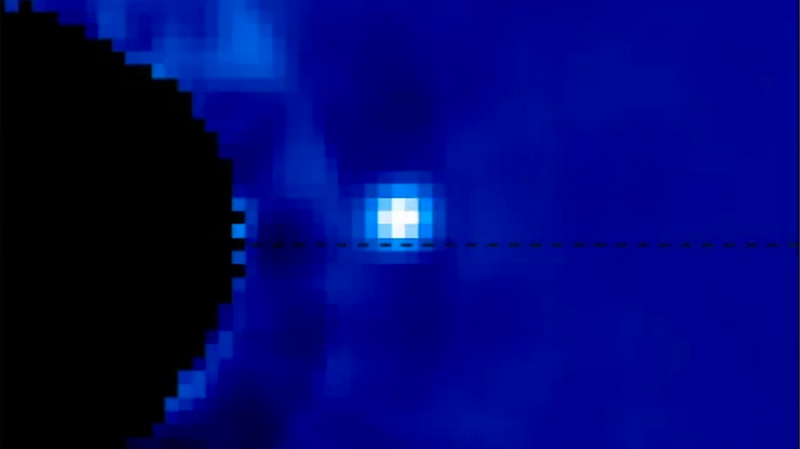 That’s some 3.527 × 1014 miles from Earth, and we’re truly able to see it! If you’re still not fascinated, think of this on for size: Beta Pictoris b is approximately a million times dimmer than its parent star. From our viewpoint, Beta Pictoris b should be totally absorbed by starlight, and yet, a group of astronomers managed by Maxwell Millar-Blanchaer at the University of Toronto accomplished to spot it, thanks to the awesome optical engineering that’s added into the Gemini Planet Imager (GPI) device on the Gemini South telescope in Chile. First, GPI’s adaptive optics system refines the image of the objective star by canceling out misrepresentation triggered by Earth’s atmosphere. Next, it uses a filter called a coronagraph to suppress all that troublesome starlight, revealing the faint glow of circling planets. This is the result from a ground-based telescope, so imagine what is going to happen when James Webb Space Telescope will send into orbit. With JWST we’ll be able to look deeper into space, erase more starlight and image planets that were unthinkable a generation ago. YOu can read the research paper here.